Heron Creek is a master-planned golf and country club community in North Port, Florida. 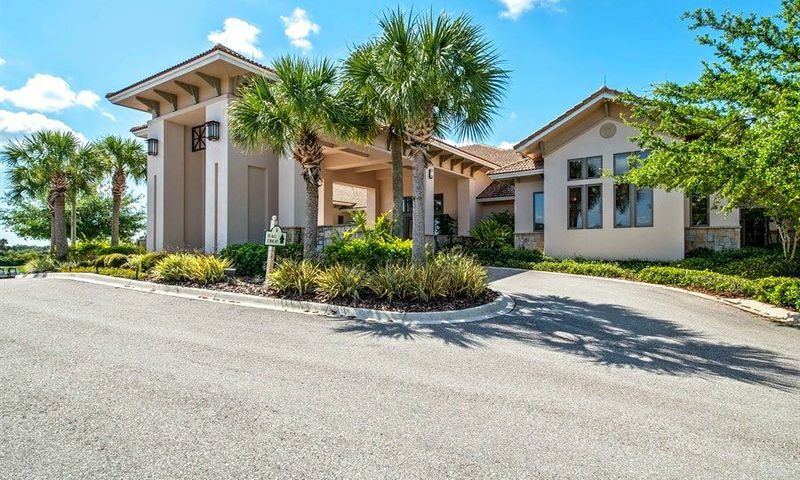 Exquisite fairways, shimmering lakes and natural preserves surround this gated community. Heron Creek is comprised of a variety of meticulously designed attached and single-family homes available on a resale-only basis. Membership plans provide exclusive access to the fine amenities at the elegant, two-level 21,000 square-foot clubhouse. These memberships include four different tiers as well as seasonal options and include the state-of-the-art fitness center, resort-style pool and spa, tennis, golf, and more. The fitness center provides stationary bikes and other equipment in air-conditioned comfort. The clubhouse also includes a multi-purpose room, meeting room, and ballroom that residents utilize for arts and crafts sessions, card games, parties, and group events. Fine and casual dining are available at the Heron's Roost Grille or at the Top of the Green restaurant. On the lower level, residents will find the golf and tennis pro shops, locker rooms, and golf cart storage. Outdoor amenities are superb as well. Tennis lovers not only have use of the five tennis courts, but can also enhance their skill by attending clinics or taking private lessons. The premier nine-hole championship golf courses that consist of the Marsh, Oaks, and Creek courses for a total of 27 holes was designed by Arthur Hills. It features golfing challenges of varying degrees in a naturally beautiful setting. The golfing experience at Heron Creek also includes a learning center with five practice greens and six practice areas. Heron Creek is comprised of 830 single-family and attached homes built between 2000 and 2011 by multiple builders. There are 16 different neighborhoods within Heron Creek and because buyers were able to choose their own developer-approved builders, the resale inventory can feature a large variety of individual upgrades that are reflected in the price. However, Heron Creek is still an affordable community and most lots are spacious with fabulous views. Most of the attached homes in this community offer two bedrooms, two bathrooms, and an attached one or two-car garage. These models are great for those looking to downsize from a single-family home without losing functionality. The single-family homes in the community offer at least two bedrooms, two bathrooms, and an attached two-car garage. These low-maintenance homes offer great golf course or water views. Located on the southwest Gulf Coast, Heron Creek in North Port is close to everything needed or wanted to lead a comfortable and convenient lifestyle. In addition to the Heron Creek Town Center next door, residents have plenty of other choices for shopping and dining in the area. Nature lovers will find many places for hiking, horseback riding, canoeing, and kayaking. Popular recreation destinations in North Port include Warm Mineral Springs, North Port Performing Arts Center, Myakka State Forest, and Little Gasparilla Island. Major cities that are easily accessible include Port Charlotte that's 15 minutes away, Fort Myers that's about an hour's drive, and St. Petersburg, which is also an hour's drive away. Heron Creek in Sarasota County is an active community with plenty of amenities and social activities to keep homeowners entertained all year long. There are plenty of activities available in Heron Creek. Here is a sample of some of the clubs, activities and classes offered here. Most of the attached homes in this community offer at least two bedrooms, two bathrooms, and an attached one to two-car garage. These models are great for those looking to downsize from a single-family home without losing functionality. Please Note: Floor plans are not available at this time. The single-family homes were built by various builders in the community and offer two to four bedrooms, two or three bathrooms, and an attached two or three-car garage. These low-maintenance homes offer great golf course or water views. Please Note: Not all floor plans are available at this time. These single-family homes were built by Whitehall Homes. They range from 2,099 to 3,796 square feet of living space. These homes offer three to four bedrooms, two to four-and-a-half bathrooms, and attached two or three-car garages. Heron Creek is ideal for us and we are very happy here. We moved here in 2010 and chose the community because of the location near our family and grandkids plus we like the fact it is NOT age restricted. If my daughter and the grandkids want to come for an extended stay with us, they can. With her husband being in the military it's nice to have that option. The clubhouse and fitness center are very nice. We love all the golf here and the beautiful landscaping too. 55places.com is not affiliated with the developer(s) or homeowners association of Heron Creek. The information you submit is distributed to a 55places.com Partner Agent, who is a licensed real estate agent. The information regarding Heron Creek has not been verified or approved by the developer or homeowners association. Please verify all information prior to purchasing. 55places.com is not responsible for any errors regarding the information displayed on this website.